In a recent Forrester survey, only 35% of CX professionals reported that they are measuring how their most important customers feel about their most important experiences. An even smaller number, 21%, were confident that they shared these metrics in an actionable way. The use of artificial intelligence can help you address both of these issues and make your customer experience measurement programs much more effective. Since CX professionals are just starting to wake up to the idea of applying AI to improve customer experience measurement, you’re probably not sure how or where to begin. 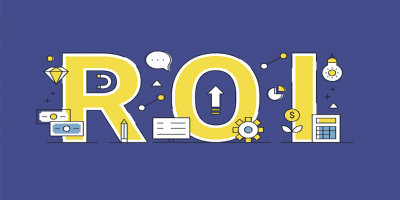 In this blog post, I detail eight uses of artificial intelligence to boost your customer experience measurement program by improving your understanding of the rich customer experience data you’re already collecting and making that data actionable. Next, I’ll describe four ways you can use AI to improve your understanding of your customer experience data and five ways to make your CX metrics actionable. 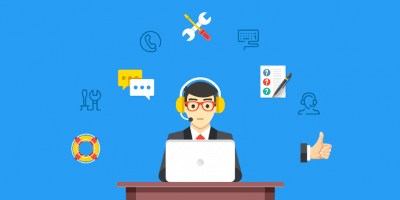 Customers today interact with companies in a variety of ways, leaving a massive trail of experience data in the form of call recordings, chat transcripts, comments on websites, and more. They even produce data on social platforms like reviews, posts and images. With this rich amount of experience data, you would think that CX professionals would be digging through all of it to measure customer experience. However, that is largely not the case. Most customer experience measurement programs are still heavily dependent on customer surveys as a single source of customer experience measurement. The most impactful uses of artificial intelligence help you to better understand the different types of customer data gathered and make better sense of it. A large quantity of unstructured text-based customer feedback today goes unanalyzed because it is tedious to mine text data. 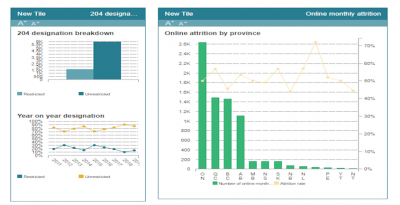 The traditional rules-based approaches that are currently used by text analytics platforms are not very efficient, as they require considerable time and skilled resources to use. Moreover, these rules need to change as the subject or language changes and often companies need to maintain one rule or model per data source. Rules need to be manually enhanced all the time and the system can sometimes become so complex that the rules start to break down. 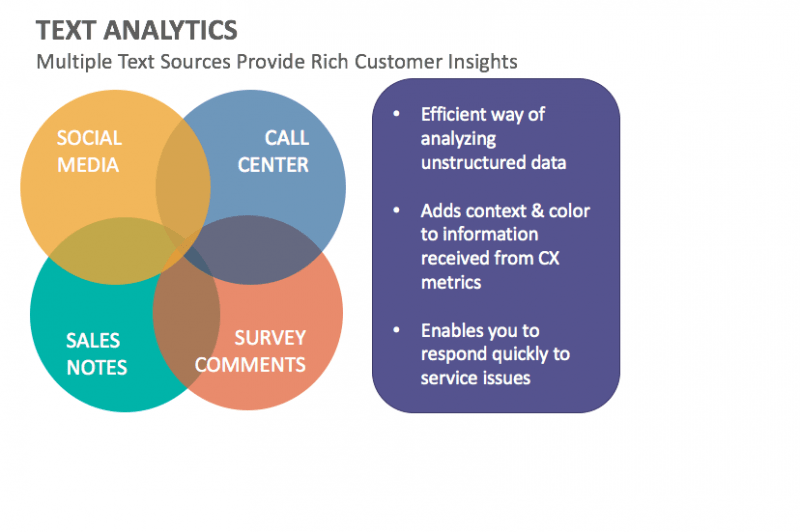 Text analytics adds context and color to the information you receive through your customer experience metrics. Take for example the Net Promoter Score®, which is a popular CX metric that captures your customers’ happiness by asking how likely they are to recommend your product or company to others. But simply knowing your overall Net Promoter Score won’t tell you why you are receiving it or, more importantly, how to improve it. 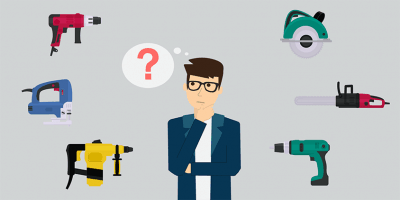 The ‘why’ comes from customer comments, social media posts and online reviews—all of which are quite difficult and labor intensive to mine without AI. I recently wrapped up a holiday in Athens. At the end of my 5-day stay in a hotel, they asked if I enjoyed my stay and would recommend the hotel to my friends and family. I offered an enthusiastic 9. The company would have been happy with my score and under normal circumstances should rightly view me as a promoter. But a few days later I posted a photo on social media in which I tagged the hotel’s rooftop restaurant and while again offering praise for the hotel, also commented on how there were no ‘smoke free zones’ anywhere to be found in the hotel. Despite my positive comments and praise, this raises a red flag which merits an immediate follow-up on the hotel’s part. If they measure my customer experience purely by the traditional NPS system and fail to correlate it with my text-based social media comments, then they will reach the wrong conclusions regarding my actual experience. Also, my public comments carry far greater impact than my private NPS feedback. In the above example, the tedious task of text mining would be made significantly easier with AI. The use of artificial intelligence in text analytics is based on algorithms that learn to understand language without being explicitly programmed to do so. While it’s difficult to accurately determine sentiment and intent using rules-based text analytics approaches, AI-based text analytics platforms perform much better. Sentiment and intent can be particularly useful for a number of use cases, such as determining why customers churn. Recent developments in the field of deep learning hold promise when it comes to the more difficult aspects of sentiment analysis, such as detecting sarcasm. A machine would have a hard time interpreting this statement as one intended to express the negative sentiment of contempt. Researchers at the Indian Institute of Technology in Bombay, for example, have developed deep learning algorithms that do the hard task of detecting sarcasm in text. Today, the utilization of speech data is largely confined to recording call center transcripts. These transcripts only capture what was said, missing entirely the auditory cues of how it was said. For instance, did the customer raise his voice? Was there an angry tone or an emotional breakdown? Speech contains valuable insights into customer sentiment and behavior that are lost if the call is not recorded or only a transcript is made available. Deep learning algorithms are bringing a revolutionary change in how speech is transcribed to text. These approaches are much more accurate for understanding emotions, intent, relevancy and topics addressed. They are also able to process significantly larger amounts of data much more quickly. These algorithms provide all the auditory cues that you need to reveal valuable insights from customer feedback, so you can take action to improve customer experience throughout the customer journey. The ability to understand and accurately predict your customers’ emotions is precious to you as a customer experience professional. Until recently, that was only possible if the customer told you how she felt. But with the advent of what is now being called artificial emotional intelligence or Emotion AI, machines can detect emotions from multiple channels—just the way humans do. In customer experience, this can make all the difference. Let’s say a machine learning program can detect that you are stressed out and plug in a call-center rep faster, reducing your wait time. The increase in empathy this would generate could stop you from churning or possibly lead to additional business by way of an up-sell or cross-sell. When it comes to customer feedback, emotional signals can provide valuable insights based on changes in facial expressions, tone and pitch of voice, body language, and even neurophysiological activity conveyed through biometric markers. mPath, an MIT Media Lab spin out, can wirelessly measure changes in skin conductance (subtle electrical changes across the skin). These signals can indicate emotions such as excitement, stress, frustration, engagement or confusion. mPath aims to provide AI-based technology to scientifically measure customers’ experiences even when they don’t describe it themselves. A recent trend among CX professionals is to make customer surveys shorter, more robust and more efficient. The typical customer survey is a one-sided static information sheet that leaves no room for customization or conversation. It is not able to adapt based on where the customer is in his or her journey. Artificial intelligence has the ability to transform the customer feedback survey into a context-aware instrument for customer engagement. You could, for example, design the survey to let users upload audio, video or images. AI could help you mine that data in real time to detect sentiment. 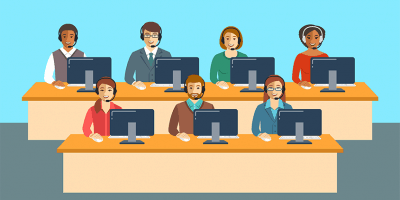 Customer service teams could then use these insights during a customer call to ask follow-up questions, resolve any complaints, accept compliments, thank customers or offer sincere apologies, as the case may be. Customer experience professionals need to measure customer feedback gathered across end-to-end customer journeys from multiple sources like customer surveys, social media platforms, call center recordings, etc. Often they need to provide this feedback to other departments, such as operations, finance, etc. However, most of this data resides in organizational silos and customer experience teams are not equipped to extract it, much less find insights from it. AI-based customer journey analytics tools can be used to rapidly and easily integrate customer data from a variety of sources to achieve a single customer view. This view reveals actionable insights from customer experience data that enables you to take direct actions that will maximize benefits for your organization, improve your customers’ experiences, take your customer experience measurement program to the next level, and make your organization more customer-centric. Customer experience teams using traditional analytics methods often fail to detect small and emerging customer experience problems. This may happen because the issue may fall outside the radar of the customer experience metrics they are monitoring. Sometimes, an anomaly may occur that represents an entirely new and unexpected pattern of behavior, so the customer experience team won’t know to look for it. The power of using an AI-based customer journey analytics tool for customer experience measurement is that it can sift through a much larger and more complex data space to uncover unanticipated issues or anomalies. AI-enabled customer journey analytics can find every single relationship in the data that exists—without expressly being told to look for it. It can predict the likelihood of future behaviors with high accuracy and find the inhibitors of current customer performance. As a result, you can spend your time sharing and prioritizing actions based on these insights instead of wrestling with the underlying data. Customer feedback offers rich data to train customer service employees. However, this feedback is typically utilized long after it’s given and without much context. When the training is sporadic, it tends to lose much of its effectiveness. Artificial Intelligence can help here too by utilizing the insights gleaned from customer feedback—often in real time. Health insurance provider Humana has thousands of customer service employees handling daily customer complaint calls. Humana knows that every call is an opportunity to create a favorable impression on a customer and generate valuable feedback for employee training. 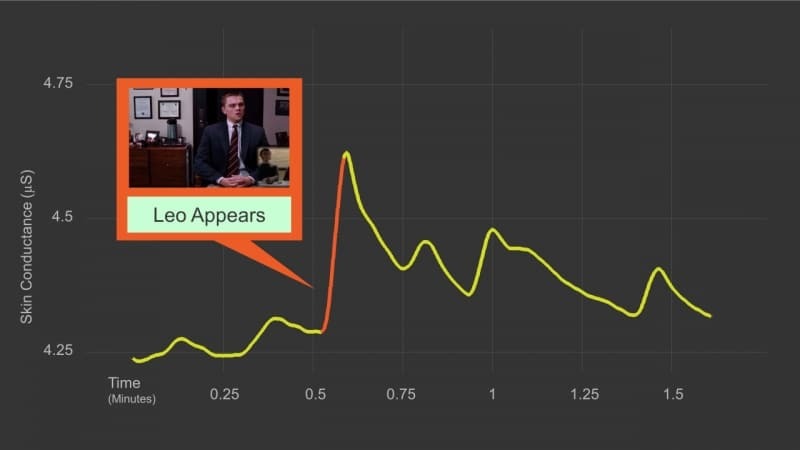 So Wilson tried an AI-based real-time conversation analysis tool that gives real-time prompts for employees and notifications on how to change their behavior. The results for Humana included a significant increase in both NPS and issue resolution. 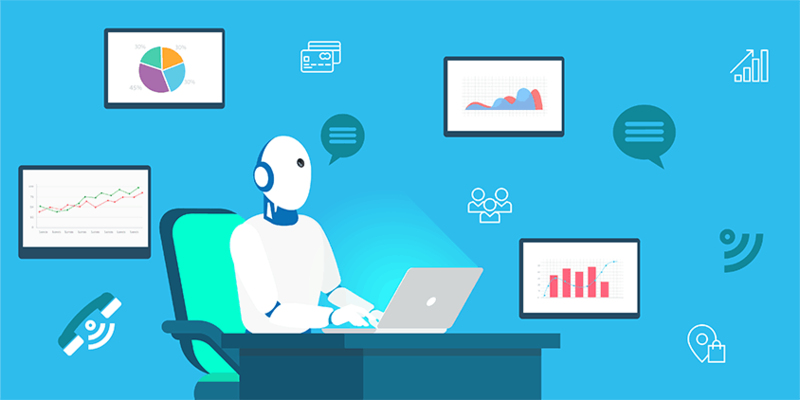 Using real-time analytics through an AI-based tool, customer experience teams can effectively train employees on how to handle customer complaints in a way that satisfies customers and helps improve retention. AI can help you increase the scope, scale and visibility of your customer experience measurement program by presenting your insights in a visual, interactive dashboard. This will keep your stakeholders and employees engaged and ensure that the customer experience measurement program is poised for growth and success. 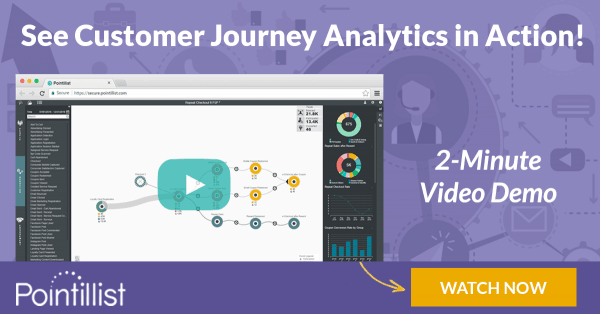 An AI-based customer journey analytics tool, for instance, can help create a consolidated visual interactive dashboard that presents all your customer experience metrics in real-time and monitors them over time. 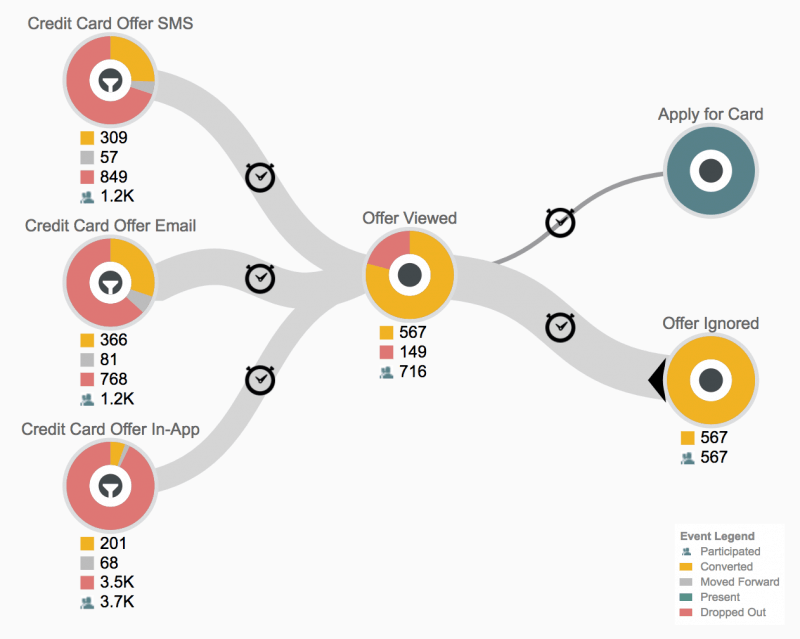 It also links these metrics to key customer journeys. But your job isn’t done by providing creating a dashboard. How many times have you provided access to a dashboard to an executive, only to have them ask for further analysis or explanation by a member of the analytics or CX team? Wouldn’t it be nice if you could ask a question and the dashboard could answer? After all, it does contain all the insights! Let’s face it. Dashboards are not made for self-service. Artificial intelligence can help here, as well. AI-based tools are now being developed that enable users to query CX metrics insights using natural language processing. This enables users to get answers much more rapidly, so that they can resolve them faster. For example, let’s say you are a customer experience manager for a restaurant and you know your food ordering app went down for a few hours. Instead of struggling through the data, if you could simply query, ‘How many customers were affected by the app outage today between 11 a.m. to 1 p.m.?’ it could provide you results much faster and help you deal with the issue more rapidly. Before you begin to applying the various uses of artificial intelligence given above for analyzing customer data, have a plan in place for where you will be getting that data from. 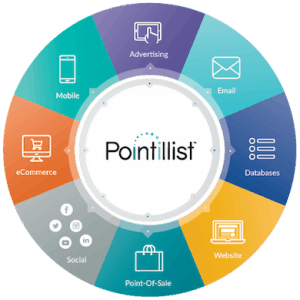 Make sure you are utilizing all possible sources of customer data in all its forms – text, speech, images, videos and emotions. It is also crucial to collect customer experience data throughout the end-to-end customer journey and not just at the time of onboarding a new customer. In this way, AI-based customer journey analytics can help you rapidly integrate multichannel data and present a complete picture of your customer. Many companies make the mistake of looking at customer experience metrics on a monthly or quarterly basis. Historically, this may have been because unstructured feedback is difficult to analyze. But this infrequent analysis also means that problems are harder to detect and more difficult to control until it’s too late. With AI, analyzing unstructured data is far easier. Therefore, make it a habit to monitor your customer experience metrics on a regular basis through interactive dashboards. Once you start using the artificial intelligence methods described above, it is important to track the results in terms of their impact on customer experience measurement. It will take time to see the results, as a lot of these processes have been traditional black boxes and some, like employee training, are hard to quantify. Tracking, measuring and providing feedback is crucial, so that the algorithms can be trained to provide better insights. As a customer experience professional, you should start preparing today to utilize artificial intelligence in customer experience measurement through the ways described above. This will ensure not only greater efficiency in your processes, but also high-quality, actionable insights that you can use to achieve your organizational KPIs.